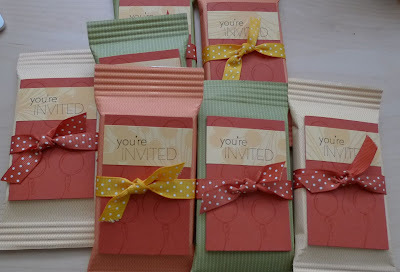 Karina's Kreations: Connor's Party Invites! What do you think of these birthday invites? They're for my son's party. Take a piece of 6" x6" designer series paper and place a Kit Kat bar in the center. Fold two sides together and attach with sticky strip. Close the ends with stick strip and place the ends in the paper crimper. The paper invite is made with a 3-1/2" x 4-1/2" piece of Dusty Durango card stock scored at 2-1/4" on the 4-1/2" side. I stamped balloons from Beary Best Friends stamp set on Dusty Durango card stock. The greeting is from the Introducing stamp set. Dusty Durango 1/2" Polka Dot ribbon tied the invite to the chocolate bar. I hope the guests love the surprise.